I was able to get show covers and cleaner along with a free towel.. thanks. It was home before I knew it and using them has been great. Loving my comeback and my new source for all my bowling needs. Keeping my shoes clean and not worrying about stepping in something. Lousy fit. Does not fit over shoes. Bowling shoes' covers are expendable, we all know that. These ones look reliable and fit nicely over my new shoes. We'll see how long they will last but from the look/feel of them, they will. This will product will protect bowling shoes against dirt, grime and moisture. And this shoe cover will last a longtime. Cheaply made. The second time I put them over my bowling shoes they ripped and they are unusable. Hello Dj, The top of the shoe cover is a nylon type fabric and the bottom is more like a vinyl fabric. Yes, this is the price for a pair. Is the pair a left and right or are they interchangeable? These are for left and right shoe covers. Do I have to order 2 to get a pair or do I order one and I get 2 shoes ( a pair)? These will come as a pair. Is the shoe cover used in place of renting bowling shoes? This will protect your shoes when not bowling, when you have to leave the lanes for something. How are the sizes compared to shoe size? These will fit according to the size chart that we have. The top of the shoe cover is a nylon type fabric and the bottom is more like a vinyl fabric. Will the covers fit over a youth size 1-2 shoe? Unfortunately, these are for men and women sizing. 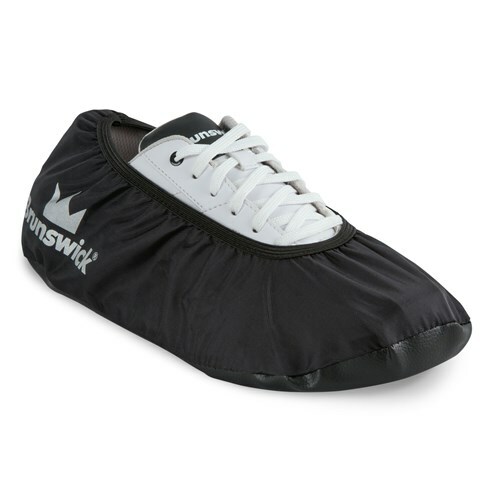 Due to the time it takes to produce the Brunswick Shoe Shield Shoe Cover Black ball it will ship in immediately. We cannot ship this ball outside the United States.